That’s not my statement, though as I’ll explain I agree with it enthusiastically. That statement comes from Jerram Barrs, in his excellent book Echoes of Eden. Barrs is not an immature culture junkie. He’s not a hipster twenty-something trying to convince teens that Jesus is cool and so is he. No, Jerram Barrs is an older gentlemen. A scholar. He’s the Resident Scholar at the Francis Schaeffer Institute at Covenant Theological Seminary, where he teaches apologetics and outreach. So one might ask how a serious scholar can honestly thank God for books that many Christians have denounced as satanic. I’ll address the concerns about occultism in a moment. First let me explain why I love these books so much, and why a scholar like Jerram Barrs is equally enthusiastic. I read the whole Harry Potter series twice in 2013. They were good for my soul. They were entertaining, yes, and millions of children and adults lugging these lengthy volumes around and becoming passionate about reading for the first time proves this fact. But these books are deeply touching and inspiring. I have been asked if I can honestly say that I love Jesus more after having read these books, and I don’t hesitate to answer: absolutely! The books don’t use Jesus’ name, but by living within these stories I am a better person and a greater lover of Jesus Christ. The Dark Lord, Voldemort, rises to power, himself consumed with evil and spreading evil throughout the world, turning the wizarding world from the good use of magic to the evil abuse of it. Intriguingly, Voldemort is connected with the image of a serpent. Then a prophecy is made, declaring that a child would be born who would be Voldemort’s demise. 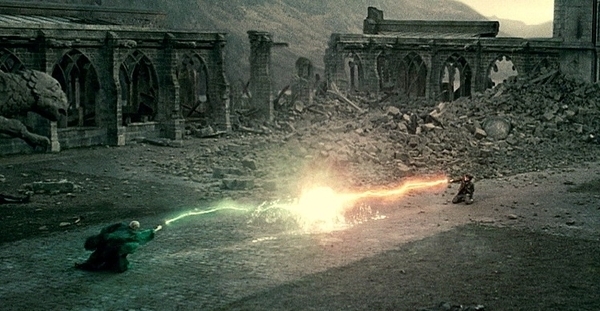 Voldemort tries to kill this child, Harry Potter, in infancy, and in trying to destroy the child he loses his own powers. Voldemort eventually regains his power and tries repeatedly to kill Harry, only to find that Harry is powerfully protected by the self-sacrificing love of his parents, his friends, and even the lowly and marginalized toward whom Harry directs his own self-sacrifical love. Harry eventually discovers that the only way to destroy the Dark Lord is to willingly offer himself as a sacrifice for the sake of his friends. When Voldemort kills Harry, Harry finds (in a chapter that is entitled, remarkably, “King’s Cross”) that he can now return to put the nail in Voldemort’s coffin. He returns and defeats Voldemort—not by issuing the deadly killing curse, but with the use of a disarming spell that causes Voldemort’s own killing curse to rebound upon himself and thereby rid the world of his evil presence. The Christian parallels are unmistakable. And this shouldn’t be a surprise: J. K. Rowling has acknowledged that she is a Christian, and she worships at the Church of Scotland. If Christians could only come to terms with their suspicions regarding the fictional presence of magic, they could find themselves greatly enriched by these wonderful stories. I am sympathetic towards those who choose not to allow their children to read these books out of concern over the use of magic. But J. K. Rowling insists that she is not interested in the occult and had no intention of promoting it through Harry Potter. I think we should take her seriously, and I do not think these books promote the use of magic in the real world. I encourage you to take a look at my thoughts on the matter. But here’s the point. Fiction is powerful stuff. Everyone is eating up these powerful stories. Seriously. The last of the Harry Potter books sold 11 million copies within 24 hours of its release, making it the fastest selling book of all time. The books have reportedly sold over 400 million copies. The last of the Harry Potter films also became one of the highest grossing films in box office history. People can’t get enough of these stories. They may not know why they find Harry Potter so compelling, but we as Christians know a powerful part of the answer: at their core these stories relate integrally to the greatest story ever told. Do not violate your conscience, but if you find yourself compelled, I encourage you warmly to pick up book 1, read it eagerly and with discernment, and see if you find the Christian nature of these books as compelling as Jerram Barrs and I do. Hi Marty. Thanks for taking the time to voice your perspective. In my post, I did more than say that I like J. K. Rowling’s writing, I was careful to explain why and what about her writing I found compelling. For this to be a constructive dialogue, I’d love to hear specifically why you disagree. Many godly people whom I respect are opposed to the Harry Potter series, so I’m all for disagreement done in the spirit of edification. Let me know what you think.